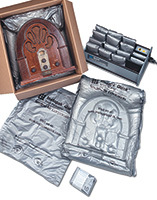 Economical and easy-to-use foam-in-bag system saves time. Protect fragile shipments with custom cushioning that expands and forms around contents. Bags require a 30 minute warm time. Must be used with warmer. 1. Apply pressure to the “Press Here” area to open the inside seal. 2. Pat parts (A) and (B) back and forth; bag will begin to expand. 3. Place the expanding foam-filled bag in the carton and nestle the product onto the cushion. 4. Follow steps one and two, and place second expanding bag on top of product to form top cushion.